There are plentiful accommodation options on Cheung Chau for those who wish to stay over for a weekend or for a longer period. Cheung Chau has always been a popular place to stay for a short trip but as it is mostly for local Hong Kong people there is more demand for budget accommodations for couples and small groups. The only major hotel on the island the Warwick Hotel was built during the 1980s as a purpose built six storey hotel. 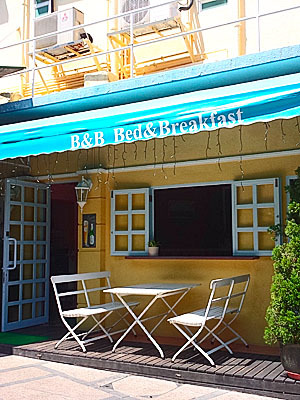 With restaurants and a small swimming pool it provides all the facilities for a luxury stay on Cheung Chau. Overlooking the Tung Wan Beach it is just a moments walk from the hotel to the beach with a long stretch of golden sand available for swimming. Rooms have balcony which overlook the sea with great views of the south side of Hong Kong island. Wifi is available. A newer addition to the accommodation options on Cheung Chau this nicely decorated building which once was the Cheung Chau Post Office is now converted to a small bread and breakfast residence. Compact rooms with large built in glass shower cubical and bathroom facilities in modern décor style. With rooms or suites available for modest rates and a full breakfast is served it makes an excellent choice for a short break. Located on the path between the Ferry Pier and the Tung Wan Beach it is very convenient both for swimming and for exploring the village. Relax on the roof top terrace and enjoy a drink while the sun goes down. In addition to the original building pictured above the management have opened several small branches, including one just steps from the Pak Tai Temple, which feature the same decore. There are many Holiday Flats or Holiday Apartments on Cheung Chau. Read this list of Cheung Chau Holiday Flats. If you are staying in a hotel elsewhere in Hong Kong then Cheung Chau is readily accessible as a day trip!